What if time has slipped by and life has happened? You're now 40 or 50. Can you still retire as a millionaire? Can you retire early and still retire as a millionaire? Although time isn't on your side like it was when you were 25, it's still possible for you to do so. But whether you're 25 or 50, you need to get started now. Most Americans, no matter their age, aren't saving enough for retirement. One in three Americans has saved nothing toward retirement. Over half of Americans have only saved less than $10,000. Over three-fourths of baby boomers aren't confident they've saved enough. By focusing on being smarter with your money, understanding compounding interests and sensibly investing for retirement, not only can you retire comfortably, but you can also retire a millionaire. By focusing on three steps to retirement wealth, you could achieve your goals. Focus on being smarter with your money, understanding compounding interest, and investing for retirement sensibly. 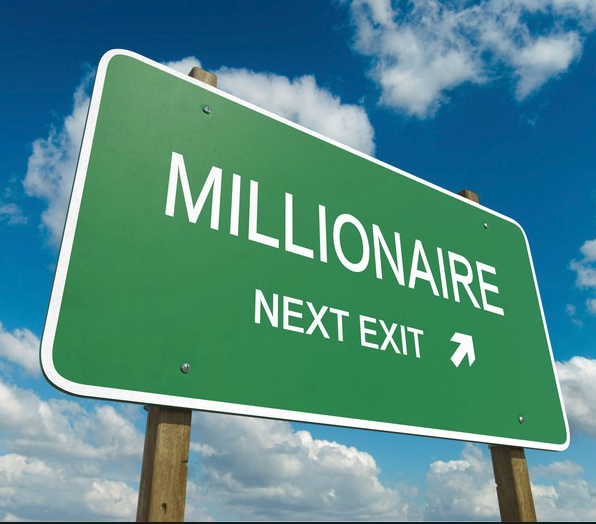 If you follow these three steps, you can be on your way to retiring as a millionaire. Let's see how. To retire with a million dollars, you need to examine where you are now financially. What is your current income? What are your current expenses? What do you have saved? How much are you currently saving monthly? Where are you presently saving your money? Does it go to a bank savings account, a 401(k) plan, or an individual retirement account (IRA)? Become aware of the full picture. Commit it to writing. Now, let's see what changes or enhancements you need to make to reach the million-dollar mark. Being more intelligent with your money starts with a long-term plan. You need to live below your means, work hard, build an emergency savings account, and start saving for retirement as soon as possible. As far as savings are concerned, you should aim for 10 percent of your salary. However, the older you get, you may need to increase that savings percentage to meet your $1 million goal. Finally, consider taxes and investment fees. Investment fees alone can have a significant impact on your investment over the long run. You want to keep an eye on these costs. If you are curious about whether you're on track to meet your $1 million retirement goal, check out our Quick Advice Retirement Income Calculator. You can plug in what you are saving and investing today to see if you're on track. If you're not, you can plug in any changes that you would need to make regarding your savings and investments to get to your $1 million retirement goal. It's easy and understandable. And better yet, it will help you plan and make better decisions as you move toward retirement. Compounding interest is the magic sauce in investments. This is why we're told to start investing at age 25 or earlier. Compounding interest is the concept of earning interest on top of interest. Time plays into this concept. The more time we have, the more interest we earn on top of the interest. And thus, our investments grow. Albert Einstein said, "Compound interest is the eighth wonder of the world. He who understands it earns it … he who doesn't … pays it." Einstein hit the nail right on the head. If you take money out of an investment, say you take out a loan on your 401(k) plan, you lose the compounded interest on the amount you distributed. The same thing applies to a distribution from an IRA account or a stock account. You miss the benefit of the compounded interest on the amount you took out and you won't get it back. You can't get time back. That's why it's easier for a 25-year-old to save than a 50-year-old, because of time. Of course, this is assuming that the 25-year-old never distributes his savings before retirement age, among other things. But you get the point. Compounded interest is your friend in investments. Your best friend. But you must be disciplined and honor the rules of no distributions. It will pay off in the long run. If you have access to a 401(k) plan or another retirement account through your employer, invest all or part of your savings into it. You can invest in employer retirement plans with pre-tax dollars, thus giving you more boom for your buck. Additionally, your employer may have a matching contribution program where they will match your contribution up to a certain amount. Take advantage of that program, or else you're potentially losing out on additional pre-tax contributions and leaving free money on the table. If you don't have access to a 401(k) plan or another retirement plan, invest part of your savings in a traditional or Roth IRA, depending on your income. Even if you do have access to a retirement plan at work, you may want to supplement your savings with an IRA and take advantage of the compounding interest in both. Additionally, you need to choose the right investments. That may sound easier than it is. Don't chase the market. Don't worry about beating the market. You don't want to be Gordon Gekko from the movie "Wall Street." You can choose an index fund that tracks a market index such as Standard and Poor's 500 Index (the S&P 500). The average return on an S&P 500 stock index fund for 10 years ending in 2012 was just over 7 percent. You may still think an indexed fund is over your head or simply something you don't have time to handle. Even if you don’t, another and possibly better option would be to evaluate an IRA that comes with professional management, making it easier for you to invest. Our IRAs - whether traditional, Roth, SIMPLE, or SEP – are professionally managed with prudently diversified portfolios and rebalancing when needed. Additionally, our managed IRAs never come with hidden fees, so you know what you're paying. The burden of investment decisions shifts from you to us. We focus on your tomorrow so you can focus on your today. Be prudent. Be reasonable. Be steady. Ask for advice. How much do you need to invest to retire a millionaire? This is a personal question - one that only you can answer. Remember at the beginning of the article we reduced your current financial standing to writing? Well, we can enter that information into more sophisticated tools, so you don't have to rely on back-of-the-napkin math. Here at GuidedChoice, we want to help you figure out how much you need to save to reach your financial goals in retirement. We have created an interactive retirement budget planner that enables you to determine how much money you'll need when you retire. We also have a retirement income calculator, which will help you calculate how much money you can expect in retirement from your current assets you have today and helps to determine if you have enough or you need to save more. Both of these free tools will help you with your retirement planning process. Once you work your way through these results, we can give you a projected retirement income, so you can see and understand where you stand today and what you need to do to get to that million dollars. We'll help you invest and rebalance, so you don't have to worry. Take the three steps toward retirement wealth today. Invest and save smarter with GuidedChoice.